depage-cms supports color schemes that are complete sets of colors that can be applied per page. This way it is easy to adjust the appearance of page, without adjusting the templates. A color scheme may also change the appearance of other elements like logos and navigational elements, so that they'll fit the chosen color scheme. 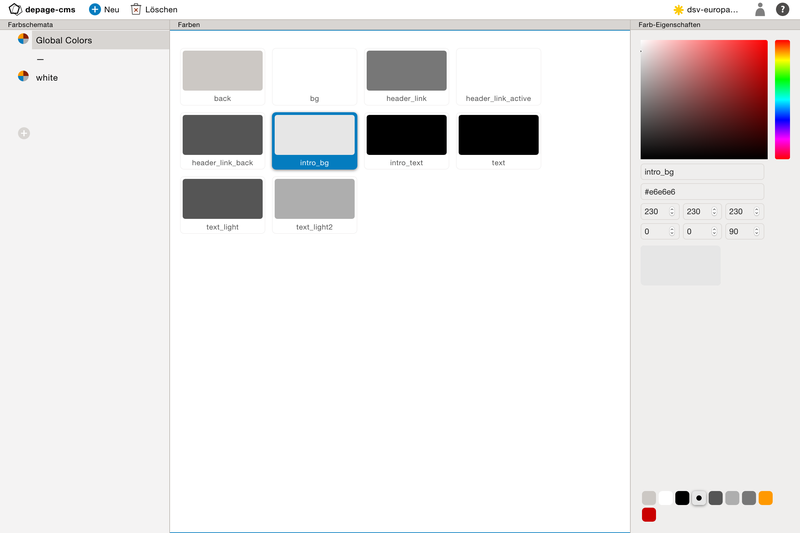 To edit a color you just have to click on it and change the color in the color chooser on the right side of the window. The first non-global color scheme doubles as the default color scheme for pages for which no explicit color scheme has been chosen by the user. Additionally to the color schemes that change per page, there are also global colors that get used on all pages. The templates change how these colors will be used. Only users that also can edit templates should add new color, rename or delete them. Normal users should only change the color values. It is the task of administrators and developers to manage the color names.